The 2011 Kia Optima Turbo is one of those upstart models that the parent company might have to watch out for. Hyundai runs the show here, you see, and its intention was for the Optima Turbo—which borrows the Hyundai Sonata Turbo’s powertrain and major hardware—to fill a sportier, edgier niche, allowing the Sonata Turbo to corral mainstream family-sedan shoppers in search of extra speed. But while Hyundai wasn’t looking, Kia went and made what could very well be a better mousetrap. The Optima Turbo isn’t just a top-notch family hauler; it’s a fairly convincing facsimile of a front-wheel-drive Audi. Offered in EX or SX trim, the Optima Turbo cuts a rakishly modern figure, even boasting Euro-style LED taillights on SX models. The cockpit-like interior has a sophisticated look and feel, with red nighttime illumination that similarly evokes European luxury marques. The capable chassis—tighter than the Sonata Turbo’s—delivers a downright Germanic cocktail of controlled compliance and confident cornering. And the 2.0-liter, 274-horsepower turbo-four’s extraordinary combination of power and fuel economy puts not only competing V-6s to shame, but also most current turbo-four offerings from the renowned induction-forcers at Audi and Volkswagen. 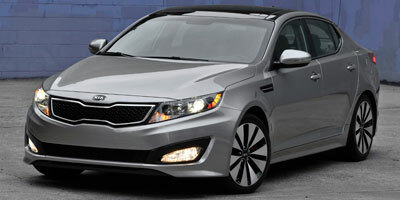 The 2011 Kia Optima Turbo isn’t perfect, but its mix of efficiency, performance, style and refinement is hard to beat. The class of high-powered family sedans has another serious contender. 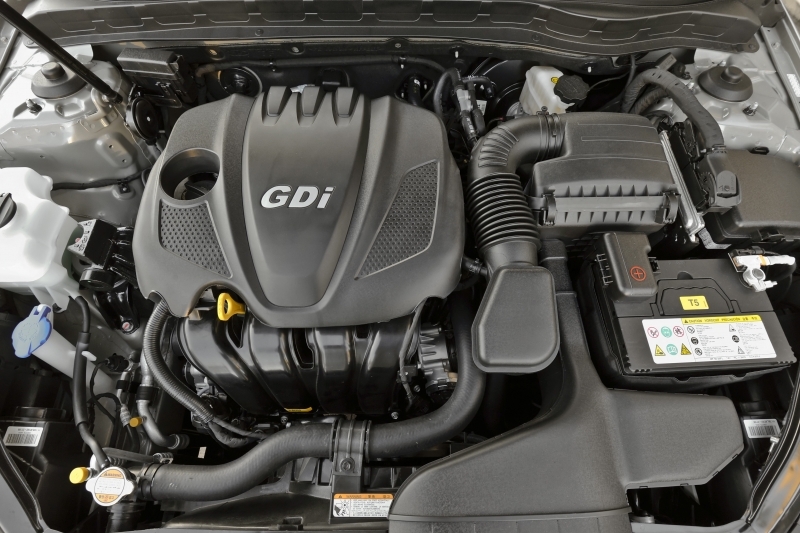 The 2011 Optima Turbo is fast yet remarkably fuel-efficient. It’s strikingly styled on the outside, yet roomy on the inside. Few if any midsize sedans can match this impressive array of virtues. Neat features abound, from the faux-leather stitched trim of the center stack to the available UVO voice-recognition system and panoramic sunroof. And the Optima Turbo comes with Kia’s 10-year/100,000-mile warranty, which should assuage consumer concerns about the turbocharged motor’s long-term reliability. The Optima Turbo rides firmly in sport-tuned SX trim—perhaps too firmly for some. The voice-recognition software isn’t always on the ball, and the navigation system’s digitized female voice is comically stilted. The sleek rear roofline limits rear headroom for taller passengers. The attractive two-tone interior treatment is offered only in EX trim. And enthusiasts may be disappointed by the lack of rev-matched downshifts in the automatic transmission’s manual mode. The Optima Turbo comes in two trim levels, each in its own state of tune. The EX has relaxed steering and a more compliant suspension, and its balance of comfort and control is about as good as it gets in this class: cornering composure is impressive, yet impact harshness rarely registers. The rather numb steering is light at first, but it weights up usefully with speed. Enthusiasts will be intrigued by the SX, which offers bigger wheels and tires, firmer dampers, heavier steering and paddle-shifters at your fingertips. The SX’s handling advantage is subtle, however, and its ride is distinctly flintier than the EX’s. Also, while the SX’s weightier steering may seem sportier, it’s still short on feel, and its heaviness can get tiresome in traffic. Although both Optima Turbo models feature larger front brakes than non-turbo Optimas, we noticed some brake fade during a demanding back-road blast in an EX. The Optima Turbo is powered by a direct-injected 2.0-liter turbo-four that cranks out 274 horsepower and 269 lb-ft of torque. The mandatory six-speed automatic transmission is smooth yet responsive, though we’d like to see its manual mode match revs on downshifts. The turbocharged motor is a gem: calm, collected and bristling with power throughout the rev range. Unlike a naturally aspirated V-6, which still requires a kickdown at highway speeds for serious passing power, the Optima Turbo’s force-fed four can chill out in sixth gear—just squeeze the throttle gently and wait for the twin-scroll turbo to waft you forward. The UVO voice-recognition interface is standard on the Optima Turbo, as are dual-zone automatic climate control with rear vents, keyless entry/ignition, Bluetooth and a USB jack. Stepping up to the SX nets nifty 18-inch alloy wheels (the EX sports 17-inch alloys), wider tires, stiffer dampers and steering, xenon headlamps and the “Supervisionâ€ trip computer, which adds a sharp color image of the Optima to the gauge cluster. Notable options include power-adjustable heated and cooled front seats with driver memory, Infinity audio, a dual-pane sunroof and a navigation system with crisp graphics and an integrated backup camera. UVO is Kia’s answer to Ford’s SYNC system. Like SYNC, the UVO interface is designed by Microsoft and allows voice-command functionality for music playback, phone calls (with a paired Bluetooth-enabled cell phone) and even SMS text messages. We encountered a few hiccups while trying to tell the navigation system what to do, but for the most part, UVO is a welcome feature that puts the Optima Turbo a step ahead technologically. 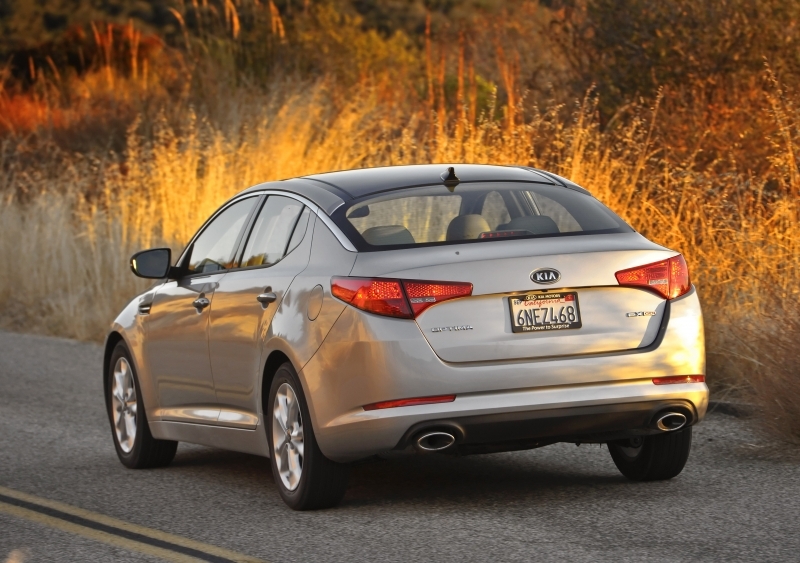 The Optima Turbo is rated at 22 mpg city and a stellar 34 mpg highway. Only the identically powered Sonata Turbo can match this rating, while most V-6-powered rivals top out below 30 mpg. Indeed, most non-turbo four-cylinder family sedans would have a hard time equaling the Optima Turbo’s efficiency. 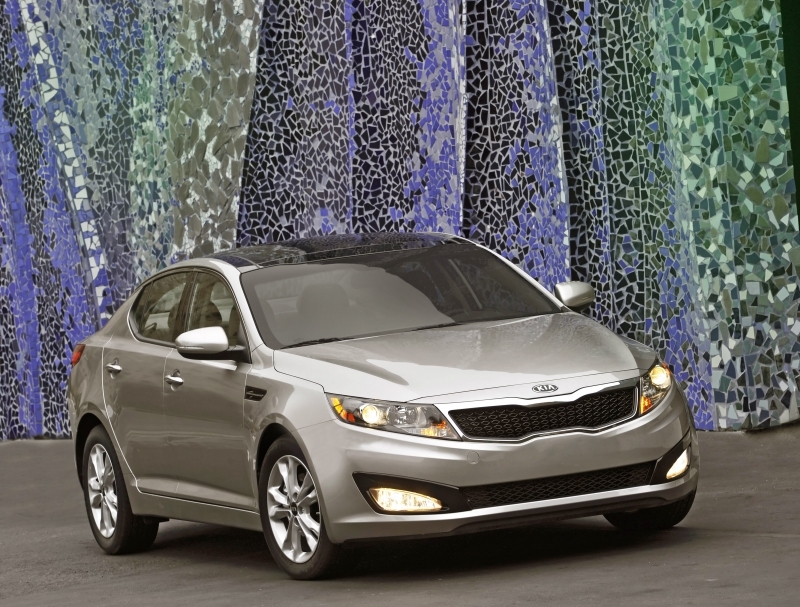 The Optima Turbo’s center stack cants toward the driver, creating a sporty, intimate feel. The buttons look and feel European, and materials quality throughout is generally good. EX buyers can choose from a pair of two-tone interior color schemes; SX buyers are stuck with an austere “black monotoneâ€ layout. In typical Korean fashion, the front seat bottoms are stubby, but comfort is satisfactory overall, with bonus points awarded for the NBA-grade legroom. Rear passengers are met by a rather low bench and ceiling, inevitable consequences of the fastback roofline; still, there’s plenty of room for average-sized adults. As daring as the new Sonata’s sheet metal is, Kia may have done Hyundai one better with the Optima Turbo. Whereas most family sedans are reminiscent of each other, this Kia brings to mind the dearly departed Pontiac G8 sport sedan. Long, low and angular, the Optima Turbo has the body of an athlete, with the SX model’s xenon headlamps and LED taillights adding an unexpected touch of class. Our only notable quibble is that the EX’s 17-inch alloys don’t fill out the wheel wells enough, and while the SX’s standard 18s look great, they’re not available on the EX. The Optima Turbo EX starts at $24,495, the SX at $25,995. That’s roughly where rival V-6-powered family sedans start, though most of them don’t offer as many useful standard features as the Kia. When equipped with their optional V-6s, the Nissan Altima, Mazda 6 and Ford Fusion offer competitive blends of athleticism, style and speed; however, none can touch the Optima Turbo’s 34 mpg. The Optima Turbo’s closest rival is probably its corporate cousin, the Hyundai Sonata Turbo, but the Kia evinces a uniquely urbane and sporting character while remaining practical and comfortable. As Korean automakers are wont to do these days, Kia has taken some cues from industry leaders (SYNC-inspired UVO; Audi-inspired interior design), added some real innovation (exterior styling all its own; 34 mpg from a 274-hp turbo-four) and ended up with something special. For now, at least, the 2011 Kia Optima Turbo might be—all things considered—the best high-powered family sedan you can buy.